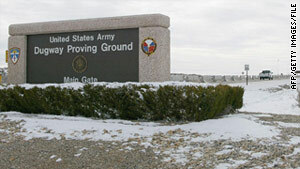 The Dugway Proving Ground is in the Great Salt Lake Desert southwest of Salt Lake City, Utah. (CNN) -- A Utah military facility that tests chemical and biological weapons was opened Thursday after a nearly 12-hour lockdown that officials said was prompted by a missing vial of "nerve agent." "On January 26, during a routine inventory of sensitive material in the chemical laboratory, Dugway officials discovered a discrepancy between the records and the agent on hand," said a statement issued by the U.S. Army's Dugway Proving Ground. "As a precaution, the commander immediately locked down the installation and began efforts to identify the cause of the discrepancy." The facility was put on lockdown about 7:25 p.m. ET on Wednesday, spokeswoman Paula Thomas said. Authorities said only that the move was "to resolve a serious concern within the Test Area." The discrepancy was found to be less than a milliliter, or less than one-fourth of a teaspoon, of VX "nerve agent," the statement said. A vial containing 1 ml was located about 3 a.m. Thursday (5 a.m. ET), the statement said. As of about 6:15 a.m., authorities said personnel had been allowed inside and would be allowed to go home shortly. "All personnel are uninjured and safe," the facility said in a news release. "The public is safe as well." VX is an amber-colored, odorless and tasteless oily liquid that does not evaporate easily unless temperatures are high, officials said. "It evaporates very slowly, almost like motor oil." People can be exposed to the agent through skin contact -- the most toxic way -- or through eye contact or inhalation, the statement said. VX affects the body's ability to carry messages through the nerves. About 1,500 employees and contractors are stationed at the proving ground, which covers 798,214 acres and is located in the Great Salt Lake Desert, around 85 miles southwest of Salt Lake City. "Testers here determine the reliability and survivability of all types of military equipment in a chemical or biological environment," according to Dugway officials.